Home » Mets Mailbag » What Is a Crawford Box? What Is a Crawford Box? Actually, the entire selection of seating behind the leftfield wall is called “Crawford Boxes”. That’s not a nickname, but the actual term used in the stadium map of Minute Maid for the seats in sections 100 – 104. Though they’re similar in location to what many other parks would call the “bleachers”, these are not bench seats, but typical box seats — and carry a $32 per ticket price tag. 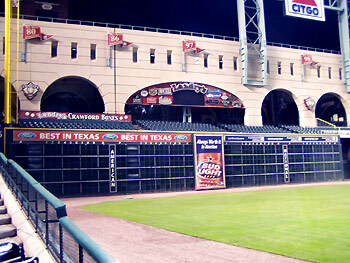 They’re called “Crawford Boxes” because the left-field wall in front of the seating is parallel to Crawford Street in Downtown Houston. However, they’re also called “Landry’s Crawford Boxes” because the section is sponsored by the Landry’s seafood restaurant chain — which you’ve likely never heard of if you’ve never left the New York tri-state area. From what I understand, any fan who catches a homerun ball while sitting in the Crawford Boxes gets a $10 gift certificate to a Landry’s restaurant, and the fans in that section are on occasion deluged with keychains, T-shirts, frisbees, and other useless crap inscripted with the Landry’s logo (much like Shea fans get pelted by Pepsi T-shirts).